The Keysight N8973A is available to buy refurbished used or rent, usually from our UK stock. Click here to download the Keysight N8973A datasheet. The N8973A is a high performance noise figure analyzer designed to make fast, accurate and repeatable noise figure measurement. It features a fequency range of 10 MHz to 3.0 GHz in a one box solution, N-type (m) connector and SNS series noise source compatibility (N4000A, N4001A, N4002A). With the N8973A ease of use features, you can set up complex measurements simply and easily giving you repeatable and reliable results you can trust. The N8973A offers simultaneous noise figure and gain measurements with the ability to view, print and save the data/display in multiple formats. It also has the ability to characterize amplifiers and frequency translating devices, including LO control over dedicated 2nd GPIB. The N8973A offers increased measurement accuracy and faster measurement speed, as well as six user selectable measurement bandwidths. 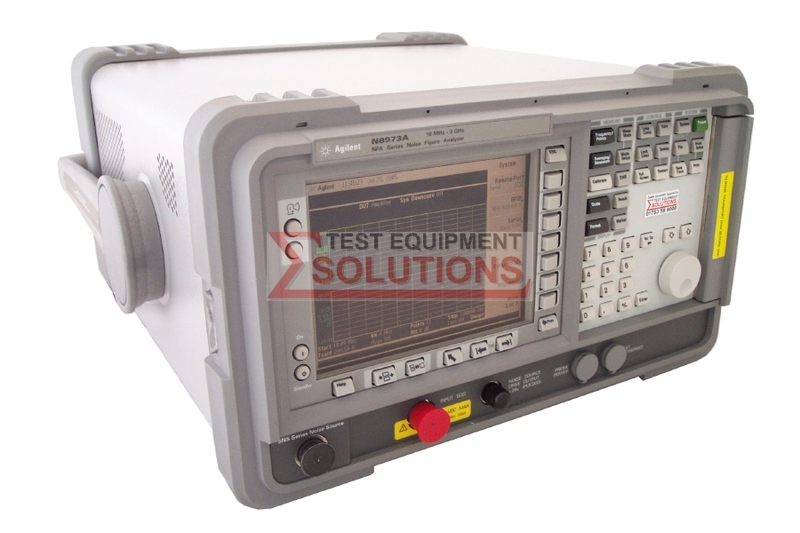 We offer the refurbished used Keysight (Agilent) N8973A 3GHz Noise Figure Analyser for sale and rental. The Keysight N8973A is fully tested and refurbished in our in-house ISO9001 calibration laboratory. We supply manuals, accessories, full warranty and a free-of-charge Certificate of Conformity. We can also provide the Keysight N8973A with a fresh calibration for a small additional charge. If you have under-utilised test equipment talk to us about trading-in or part-exchanging it towards the Keysight N8973A or other refurbished test equipment.